Q: My once brilliantly green and thriving Indian hawthorn now has yellowed foliage marred with brown mottling and spots. What is this and how should I treat it? A: Your Indian hawthorn has Entomosporium, or fungal leaf spot. It’s a common problem during our frequent summer rains, exacerbated by high humidity and damp conditions. In Indian hawthorn, fungus often first appears as a yellowing of the leaves followed by visible spots. These spots may be small, large, few or many, and occasionally can consume the entire leaf. Affected leaves may turn tan or red and even fall off if left untreated. How does it happen exactly? Fungal leaf spot occurs when airborne spores are deposited on wet foliage. The water activates the spores and they begin to grow. To stay ahead of the fungus game, plant varieties of Indian hawthorn that aren’t susceptible to leaf spot, such as Olivia, Eleanor Tabor, Indian Princess, Gulf Green, Georgia Petite and Georgia Charm. Use drip irrigation, if possible. Be sure to remove severely infected leaves and throw them away (that goes for fallen leaves, too). 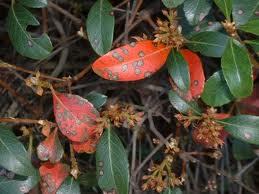 Fungus prefers to infect tender, young leaves, so hold off on pruning and fertilization. Both practices encourage new growth during the growing season (translate: more spores). Fortunately, a broad-spectrum fungicide can successfully treat and help prevent leaf spot and other fungal diseases. Don’t let fungus have a field day with your Indian Hawthorne. Apply a fungicide as soon as new growth appears each year to keep your plants healthy and looking their best. Thanks very much to everyone for the successful completion of our villa landscape project this morning! We told Daniel (crew chief) and his team they did a great job, gave them a big bag full of snacks, and said we'd put in a good word for them. Daniel and crew were very personable, helpful and exceeded our expectations. They all worked very well as a team, got the job done in a timely fashion, and did a great job cleaning up before they left. Keep up the good work! Originally we were in favor of keeping our current vendor as our landscaper, but NOW we're very happy ArtisTree has taken over. For whatever our humble opinion is worth, we've been VERY impressed with the ArtisTree employees we've met over the past few weeks: Ginger, Luis, Rex, and today Daniel.